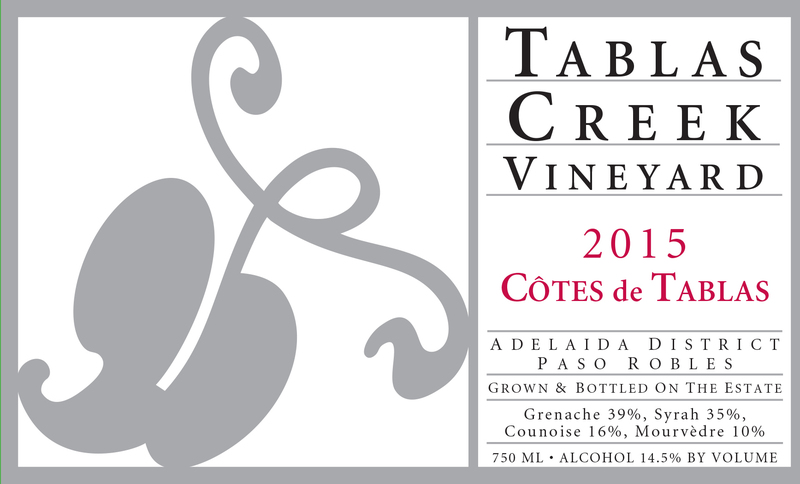 The Tablas Creek Vineyard Côtes de Tablas is a blend of four estate-grown Rhône varietals: Grenache, Syrah, Counoise and Mourvedre. Like most wines of the Southern Rhône, it showcases Grenache, featuring that grape's characteristic generous fruit and refreshing acidity, balanced by the spice and mineral of Syrah, the appealing briary wildness of Counoise and the structure of Mourvèdre. The 2015 Côtes de Tablas has a spicy Grenache-led nose, despite the relatively high percentage of Syrah: wild strawberry, mint, fresh figs, and an undertone of chorizo-like meatiness. In the mouth, lifted fruit is balanced with richness, like strawberry shortcake, with complicating flavors of Mexican hot chocolate, cola, and fresh dates. Drink now and over the next decade. The grapes for our Côtes de Tablas were grown on our certified organic estate vineyard. The 2015 vintage saw dramatically reduced yields from the combined effects of four years of drought and cool, unsettled weather during May's flowering. Months alternated between significantly cooler than normal and significantly warmer than normal, which produced an early start to harvest but required multiple passes through most vineyard blocks during a long, drawn-out picking season. Yields were down as much as 50% in early-ripening grapes like Syrah, while later grapes like Mourvedre were only down slightly. The result was a vintage with excellent concentration but unusually good acids, and wines with dramatic aromas, texture, and intensity. Our Syrah was harvested between September 9th and October 5th, Grenache between September 10th and October 8th, our Counoise between September 26th and October 14th, and Mourvedre between September 23rd and October 15th. All varietals were fermented in a mix of stainless steel and wooden upright fermenters with the use of native yeasts. After pressing, the wines were racked, blended, aged for a year in 1200-gallon French oak foudres, and then bottled in February 2017. The wine is unfined and underwent only a light filtration before bottling.